ISTANBUL —Turkish President Recep Tayyip Erdogan’s AKP looked set for defeat in the capital Ankara and faced a dead heat in Istanbul after Sunday’s local election delivered a blow to a party in power for a decade and a half. Erdogan and his Justice and Development Party (AKP) have won every vote since the party first came to power in 2002, but they had risked losing Ankara and faced a tough fight in Istanbul as an economic slowdown took hold in Turkey. With 99 per cent of the ballot boxes counted, the joint opposition candidate for Ankara mayor was winning with 50.89 per cent of votes and the AKP on 47.06 per cent, Anadolu state agency reported citing preliminary results. But in Istanbul, Turkey’s largest city and economic hub, the race for mayor was deadlocked with the AKP candidate claiming victory with 48.70 per cent of votes, but his opponent on 48.65 per cent also claimed he had won, after almost all ballot boxes were counted. "If there are any shortcomings, it is our duty to correct them," Erdogan told thousands of supporters in Ankara without referring to the loss of the city directly. "Starting tomorrow morning, we will begin our work to identify our shortcomings and make up for them." The Turkish leader suggested if his party lost in Istanbul, they would still control the district council even if the opposition held the mayor’s office. But Erdogan, whose ability to win continuously at the polls is unparalleled in Turkish history, was more vulnerable with the economy in recession, unemployment higher and inflation in double digits. Much of the AKP’s success has been down to Erdogan’s perceived economic prowess, but days before the vote, the Turkish lira was sliding again, provoking memories of the 2018 currency crisis that badly hurt Turkish households. In Ankara, Mansur Yavas -- the candidate for both the opposition Republican People’s Party or CHP and the nationalist Good Party -- claimed victory in a large rally full of supporters waving red Turkish flags and setting off fireworks. "No one has lost. Ankara has won. All of Ankara has won, hand in hand," he said. During voting, two members of Saadet (Felicity), a religiously conservative party, died after a fight between two groups in Puturge in eastern Turkey, private DHA news agency reported. The Malatya governorate said four individuals were detained. In Istanbul, a city where Erdogan had described victory as like winning Turkey itself, the race had been very tight. Erdogan fielded one of his loyalists, former prime minister Binali Yildirim, in a push to win the city. "We have won the election in Istanbul. We thank Istanbul’s residents for the mandate they have given us," Yildirim told supporters as final tallies were coming in. But his opponent Ekrem Imamoglu dismissed Yildirim’s claim as an attempt to manipulate opinion. "I would like to announce to Istanbul’s residents and all of Turkey that our numbers show that it is clear we won Istanbul," Imamoglu said in a speech in the early hours of Monday. For his supporters, Erdogan remains the strong leader they believe Turkey needs and they tout the country’s economic development over the years he and the AKP have been in power. 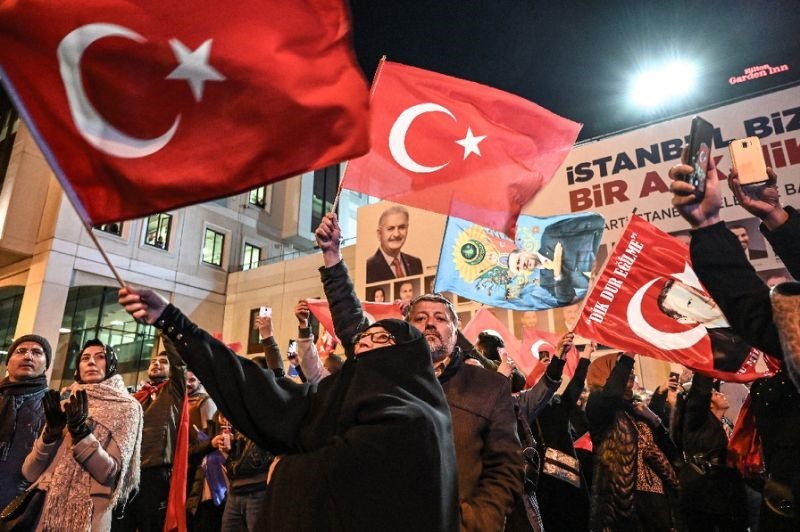 The vote was the first time since 2002 that the AKP fielded candidates with its alliance partner, the rightwing Nationalist Movement Party (MHP).